We’d love your help. Let us know what’s wrong with this preview of Journey of Souls by Michael Newton. To ask other readers questions about Journey of Souls, please sign up. I liked this book, but I was wondering that when we are suffering beside our soul, our body also suffer. So how we can justify this?? soul's suffering can be justify by our past experience, but our body and our mind is only experience one life, then why this body must suffer? I wished this book could answer this question. anyway I enjoyed that, as I always believed in reincarnation. Swati Garg Quite a late reply but i just stumbled upon this book today and hence your Q. This is basically from my personal experience being a soul healer that i…moreQuite a late reply but i just stumbled upon this book today and hence your Q. This is basically from my personal experience being a soul healer that i am! I love this book, It give an insight of life and after death. In book it mentioned everyone will get chance to choose their life. Choosing life based on past Karma and what we should learn in new life. I wonder when we choose life do we decide in the initially how many days/years we would live o earth. or this will be decided by spiritual master? Or lifetime of one will change as they do good deeds on earth. We can speed up learning the love-lessons our spirit guides and Elders would have us learn, but there is also a certain amount of time we must spend on these things. You can't skip steps in such a gradual learning process—I should say "unlearning" because we are slowly learning to disavow our ego. بدون شک هیچ وقت مطالب این کتاب از یادم نمیره ، نه به عنوان یک منبع مورد اعتماد بودنش که در این باره از علم من خارجه هرچند با توجه به مطالعاتم در مورد امواج مغزی میتونم بگم در شرایط خیلی خاصی و کاملا حرفه ای ممکنه بدون مرگ یا ترک موقت جسم مثل حالت کما امکانش باشه برخی باشن که تحت هیپنوتیزم و رفتن به حالت تتای عمیق توسط یک فرد حرفه ای در این حوزه یک چیزهایی رو به یاد بیارن ولی فکر نمیکنم این روش روی هر انسانی جواب بده ، این کتاب به یادم خواهد ماند فقط به این دلیل که در بخش نتیجه گیری کتاب نویسنده بدون شک هیچ وقت مطالب این کتاب از یادم نمیره ، نه به عنوان یک منبع مورد اعتماد بودنش که در این باره از علم من خارجه هرچند با توجه به مطالعاتم در مورد امواج مغزی میتونم بگم در شرایط خیلی خاصی و کاملا حرفه ای ممکنه بدون مرگ یا ترک موقت جسم مثل حالت کما امکانش باشه برخی باشن که تحت هیپنوتیزم و رفتن به حالت تتای عمیق توسط یک فرد حرفه ای در این حوزه یک چیزهایی رو به یاد بیارن ولی فکر نمیکنم این روش روی هر انسانی جواب بده ، این کتاب به یادم خواهد ماند فقط به این دلیل که در بخش نتیجه گیری کتاب نویسنده از یافته هایش گفته و اینکه اگر با خوندنش به هیچ چیز نرسیده باشیم جز اینکه ما هویت جاودانه ای داریم که ارزش جست و جو کردن و کشف و یافته شدن رو داره ، در این صورت پیام این کتاب و گزارش هایش از زندگی ارواح و عالم ارواح به هدف خودش رسیده خواه باورش کنیم یا نکنیم و فکر کنیم سر کاریم ! I have read many books regarding this subject and was not surprised to discover the author spent a lot of time in military schools . Although the book is about life between lives & spirituality , it lacks the essence of spirituality . It lacks the focus on love, compassion and human emotions . Instead it appears the author is focused on putting together a "system" an "order" of spiritual life - perhaps from military training . It lacked the "heart" I have felt while reading other books on th I have read many books regarding this subject and was not surprised to discover the author spent a lot of time in military schools . Although the book is about life between lives & spirituality , it lacks the essence of spirituality . It lacks the focus on love, compassion and human emotions . Instead it appears the author is focused on putting together a "system" an "order" of spiritual life - perhaps from military training . It lacked the "heart" I have felt while reading other books on this subject . The clients seem to be rushed thru the emotional essence of their experience , even while crying , the author brushes past these amazing moments that are so moving and highlights the "organizational chart" of the after life . After reading this book I suspected my afterlife would be another system I would have to learn to navigate , such as college, being a state employee or going to the DMV . I would eventually reach a goal but become exhausted doing so . بیشتر از نصف کتاب رو خوندم. ولی متاسفانه واقعا نمیتونم با فضاش ارتباط برقرار کنم. بله میدونم که مستند و علمی و همهی اینهاست. ولی برای من باورپذیر نبود متاسفانه. البته بدم نمیاد که تمومش کنم. ولی بعید میدونم حالاها برم سراغش. بیشتر از نصف کتاب رو خوندم. ولی متاسفانه واقعا نمی‌تونم با فضاش ارتباط برقرار کنم. بله می‌دونم که مستند و علمی و همه‌ی اینهاست. ولی برای من باورپذیر نبود متاسفانه. I can sum this up in one word: interesting. A look behind the curtain of death. . . and rebirth. We’ve all heard the stories about near death experiences (NDE) where the spirit hovers above the body of the deceased and then drifts through a tunnel toward a bright light where they see relatives who preceded them in death. Typically that is all we learn. This book tells the rest of the story. I won’t give any spoilers but would rather comment on the methodology. I don’t claim to understand how hypn I can sum this up in one word: interesting. A look behind the curtain of death. . . and rebirth. We’ve all heard the stories about near death experiences (NDE) where the spirit hovers above the body of the deceased and then drifts through a tunnel toward a bright light where they see relatives who preceded them in death. Typically that is all we learn. This book tells the rest of the story. I won’t give any spoilers but would rather comment on the methodology. I don’t claim to understand how hypnosis works but I find it very hard to discount that these people from all walks of life are able to recount nearly identical stories without previous knowledge of such stories. It is similar to the stories told by UFO abductees under hypnosis. How can people from all walks of life, from all over the world (all languages and all religions), without prior knowledge be able to recall similar experiences, procedures, and alien writings? I’m a definite UFO buff and hypnotic regression has intrigued me for some time. Now after my first foray into hypnosis for past life regressions, I cannot help but think that there is some connection between the two. UFO abductees recount travel up to crafts in light, claim that these UFOs travel via light, perform various procedures using light, and now learning that souls and the spirit world are all made of light leads me to think that this is the common thread between these two “worlds”. Based upon this, I would not be surprised that more and more future technologies will be developed using light. It's really a great book!! Bring so much controversials yet intriguingly to read. It's hard for me to put down the book, not before I've finished it. If you believe in the spirit world, this book is for you in that it will fill in many gaps you might have regarding this subject. If you are new to the subject, then this book is also for you, because after reading you will never look back, wanting to explore more,..
Have you ever wondered why we are here? What is our purpose? Who are we supposed to b It's really a great book!! Have you ever wondered why we are here? What is our purpose? Who are we supposed to be with? What is the point? This courageous book attempts to answer these questions through the ambitious effort of hypnotic recall through past-life therapy. Given the level of commitment and the consistency of the responses, Michael Newton paints a very credible picture of where we have come from, where we are going and why that answers many other questions of time and space. It's a fascinating read for those with an open mind, and provides thought-provoking comfort to those who currently find life frustratingly meaningless. Sceptics to the book's content will find 101 reasons why this book is the workings of imagination, my only argument to this is, if Michael Newton has written this book from imagination, then as well as gifted, he is a thoroughbred genius! Most individuals cannot fault his methodical approach. Journey of The Souls is one of the best books I have ever read, and I read so many times just to feel the sensation of reincarnation. It comes highly recommended and Journey Of Souls should be on everyone's bookshelf. If you are at all interested in life after death or life between lives, i strongly recommend you read this book.It changed my view of things beyond anything I had read before.You will not be dissapointed. I read this book for the first time 10 years ago when a friend of mine gave it to me to read. It left quite an impression on me since I have been thinking about it ever since. About one month ago, I found it again in a used book store and read it in a few days. It seems that timing aligned again since it showed up just as I've been exploring the "spirit world" recently through authors who have written about their near death experiences. One major reason I loved this book is because the author him I read this book for the first time 10 years ago when a friend of mine gave it to me to read. It left quite an impression on me since I have been thinking about it ever since. About one month ago, I found it again in a used book store and read it in a few days. It seems that timing aligned again since it showed up just as I've been exploring the "spirit world" recently through authors who have written about their near death experiences. One major reason I loved this book is because the author himself was quite skeptical about past life regression early on in his career. I saw an interview of him, and he actually used to turn people away who requested past life hypnosis. It was by accident that one of his hypnotized clients started talking about a past life accidentally that got him intrigued by this practice. I always appreciate someone who starts out as a skeptic and ends up a believer through having consistent evidence at his finger tips. The book basically takes the reader through what happens to a soul when the body dies by using conversations written down verbatim by his clients. He then puts these conversations in context by explaining whether a particular client represented most of his clients or not. It was fascinating! I have a problem with the idea of past lives and with karma generally, but I found this book to be both encouraging and hopeful. The best feature of the book is it's detailed description of an afterlife experience that goes far beyond "seeing a light" or a "tunnel." The worst feature of the book is it's depiction of punishment. Souls atone for the sins of their past lives. Someone who abuses women could be reincarnated as an abused woman. While this may look like an opportunity for second chance I have a problem with the idea of past lives and with karma generally, but I found this book to be both encouraging and hopeful. The best feature of the book is it's detailed description of an afterlife experience that goes far beyond "seeing a light" or a "tunnel." The worst feature of the book is it's depiction of punishment. Souls atone for the sins of their past lives. Someone who abuses women could be reincarnated as an abused woman. While this may look like an opportunity for second chances, it is more complex then that. I believe that we can and should help people who are suffering. And, I don't believe this teaching allows us to help people in need without negatively impacting their karmic atonement. If they are not abused, then how can their soul learn from the abuse? They will need to be abused again in their next life because somebody helped them? That's sick. It is amazing to me that 29 people all recalled the same vision of our life between lives, but I do not believe in past lives (even if people under hypnosis recall them) and I do not believe in karma. This is another world view-changing book, or should I expand to say, universe view-changing? Like Spirit Babies by Walter Makichen, this book talks a lot about karmic reasons for our various incarnations on Earth (and possibly other planets from time to time). Dr. Newton uses regressive hypnotherapy to take people back to before they were born in this life and we see some of his subjects' past lives and what the spirit world looks like in between physical incarnations. Since I'm already a firm b This is another world view-changing book, or should I expand to say, universe view-changing? Like Spirit Babies by Walter Makichen, this book talks a lot about karmic reasons for our various incarnations on Earth (and possibly other planets from time to time). Dr. Newton uses regressive hypnotherapy to take people back to before they were born in this life and we see some of his subjects' past lives and what the spirit world looks like in between physical incarnations. Since I'm already a firm believer in reincarnation, I was glad to get detailed accounts without the author trying to "prove" anything or convince me. Apparently this author was an atheist for a long time before he began his studies and changed his mind. What incredible book! As usual when I find books like this I feel I was 'led' to them as there is something for me to learn about my current experiences in life. I have been researching and reading about reincarnation since I was a teen (long time ago!). There are many books about that but not so many that address the in between part of living. All about heaven, and it is so realistic and genuinely presented you don't doubt the authenticity of the recollections of Newton's subjects under hypnosis. I can read this over and over and over... I have learned to look at my personal life challenges as necessary obstacles in order that I may progress by mastering areas of my life that are mentally and emotionally challenging. As I have always told others, life is a testing ground for the heart's intentions and desires, and it is up to us to subdue our passions and overcome greed, hatred, and delusion. I would recommend this book to anyone who would love to change their angle (perspective) on life I can read this over and over and over... I have learned to look at my personal life challenges as necessary obstacles in order that I may progress by mastering areas of my life that are mentally and emotionally challenging. As I have always told others, life is a testing ground for the heart's intentions and desires, and it is up to us to subdue our passions and overcome greed, hatred, and delusion. I would recommend this book to anyone who would love to change their angle (perspective) on life and experience a conscious re-birth. Reading this book liberated me to the nth degree. In most, if not all religions, there is some type of evaluation of the effects of different phenomenon. To most this is known as karma, or a type of judgment. In some religions this evaluation is done by a temperamental anthropomorphic God, who surely must have known the outcome of the critique even before the creation of the person being judged. Be assured that there are only "LAWS" that govern the Cosmos, be they physical Laws, Metaphysical Law Reading this book liberated me to the nth degree. In most, if not all religions, there is some type of evaluation of the effects of different phenomenon. To most this is known as karma, or a type of judgment. In some religions this evaluation is done by a temperamental anthropomorphic God, who surely must have known the outcome of the critique even before the creation of the person being judged. Be assured that there are only "LAWS" that govern the Cosmos, be they physical Laws, Metaphysical Laws, or Divine Laws, they are still Laws that can be understood by anyone who chooses to do so. For such a person ignorance is not an option, and enlightenment is the purpose of existence. This text seeks to unfold the implicate order of the "mystery" of the after death scenario. Dr Newton, as a licensed regressionest , is able to hypnotize his subjects, and allow them to regress to the time in between their last life. He then engages in a session in which he cajoles various subjects to describe what happens after their death from previous lives. The grand epiphany was that you judge yourself. One of the things that kept popping up in the book was that people were a lot harder on themselves than their guides, or the rest of reality for that matter. One of the worst conditions a person can put themselves in, is that of a prison of grief and regret. This is the closest state to hell that I saw throughout the book. Because of the nature of time in that dimension, time is felt as value fulfillment. A good example given by Dr Newton is that of a lady who was grieving after she had died, because her parents did not allow her to marry the boy she loved. She was 16, and thought there was no need to continue with life, and she ended hers. After death, as a sign of protest, she refuse to move on and grow. She stayed and languished at her old house for what she thought was about 4 days, in earth time it was 4 years. Her guilt was that she wasted an opportunity to learn, while in the physical body. The lady ended her life for what seemed like a petty reason, and her profound funk was self created, and complete. When she realized she was the judge, jury, and jailer, the epiphany of the simplicity propelled her soul to go beyond what it was, and evolve. She realized in some strange way, that she would always be her greatest critic, and her greatest teacher. The author then gives a different example in another area of the soul's existence. This area deals with how a soul decides on the type of life they want to live, and what they hope to gain by becoming a physical being. This case deals with a woman who wanted to be a writer. In this woman's/soul's past life something had always interfered with that dream. In the soul's next life it was decided that there would be some type of illness or accident that would limit the persons life choices. It was hoped that this person, with the handicap, would focus on writing to compensate for the lack of other opportunities. Once this person committed to this scenario, a type of accident was agreed upon, in this case it was the crushing of her legs from a carriage accident. The person had to "remember" to allowed the accident to happen in hopes to galvanize the growth the soul wanted. Once the person committed to memory the plan, they then had to forget it, because if a person knew all the mishaps that might befall them, it might incapacitate most people. When the time came for the event to happen (she was 12) a subtle (subconscious) voice told her to prepare herself, and at the appropriate time she leaned against the carriage door and it flew open, and the young girl fell out of the carriage and under the back wheel, crushing both her legs. The person did become a good writer, because she had both the affinity and opportunity to cultivate her writing interest. This would be called a preordain accident that helped to fulfill a future event that already was. The author gives accounts such as this to illustrate actual cases of people, and to explore a possible metaphysical interpretation. The events that we think are accidents are no such thing. This reviewing/remembering is done after a person has died, and they are now reviewing their life with the full knowledge of why they chose the events in the first place. During this event there is a council of elders, who monitors your evaluation of yourself. This evaluation is done in a type of temple with a number of guides and people who were significant in that person's life. The person is at the center of this intimate temple, and a 3 dimensional display of the person's life is presented. You see all the hurt and joy you brought to the world around you, and every minute detail is explored. Dr Newton does a good job in prompting the subjects to articulate more on this scenario. After this review of ones life is done, an over all assessment is asked of the person. The person usually comes to a fairly accurate evaluation, of how they choose to use their free will. Dr Newton states that there is a change in the vibratory rate of a person when they are honest with the true nature of events, and it is this change in ones being, that is the true litmus test of a person's evolution. As your vibratory rate/frequency changes, you shift to higher dimensions, and you move closer to evolving into the rest of your higher self. Това е Книгата, която всеки интересуващ се от минали животи и структурата на духовния свят трябва да прочете. Знаех, че книгата ще изобилства с регресии от практиката на Д-р Нютън, но не подозирах колко детайлни и информативи ще бъдат те, и колко много ще ме впечатлят. Чувствам се невероятно обогатена! I'm open to the concept of reincarnation. It has been the one metaphysical, spiritual, big-unknown (call it what you will) that has always appealed to my imagination and also my sense of fair play. Have we lived before? (Magic 8 ball says yes.) Will we live again? (again, yes) Are we drawn to certain people to play certain roles in our lives (both positive and negative) for a larger reason? And will we interact with these identities again and again while we are all trying to get it right? Bingo! The rational part of me is sheepish. But I love the concept of this book and I WANT it to be true. A very cursory search on the author (ok, it was one Wikipedia search) did not make reference to swindles, cons or some sort of New Age cult. Michael Newton apparently is a counselor with a doctorate and an academic background. He was a self identifying atheist. He seems to embrace science. And he has 30 years of clinical cases where he apparently has regressed clients through hypnosis into knowledge of past lives and even a resting place between these earthly quests. The clients all report markedly similar experiences beyond physical death. This book concentrates on the reported experiences in a separate plane of consciousness where souls go to recover from their most recent incarnation and to study the lessons learned, the missteps taken and the overall purpose of that life. In this plane, individual souls are reunited with their core group of fellows, where these "soul groups" study together, support one another and prepare for the next go round. The format in Journey of Souls is a very basic recount of recorded hypnosis sessions. The language is not "new agey" in tone. Except for the suspension of disbelief many readers (especially of Western culture and tradition) will need to employ in order to open their minds to this possible explanation of "the meaning of life" --I do not believe that the style of the book will be off putting. The cover is stereotypically New Age. But don't let the chakra-and-crystals vibe dissuade you from a book that makes for an amazing way to look at existence...even if you are not prepared to take the book literally. Who am I? And, what am I doing here, now? Think about it. That is just about the crux of a life. Journey of Souls prompts many constructive and comforting ideas to help unlock the answers to those questions. Newton advances a premise that the purpose of life relies upon our ignorance of life outside of this mortal period, but this is quite at odds with his efforts to expose what life outside of mortality is like. What sits particularly ill, though, is the observation that one can really only know about these things through the medium of a hypnotist. Even if you believe in hypnotism, isn't this something we already saw and disliked in the Catholic Church, the attitude that one can only reach God through the medium of a priest? It's a shame to have to rely on an intermediary who is just as corrupt and incompetent as the human race generally. Outside of what a hypnotist may tell you about this subject, there is paltry evidence for anything that Newton promulgates. That evidence amounts to flashes of inspiration, such as, "Go marry that woman," and unfortunately for Newton, this brand of evidence integrates equally as well or better into myriad religions and fringe theories. Anybody who is spiritually minded and has an interest with the afterlife should definitely begin their quest by reading this book. I always find, it is worthwhile to explore any author's background before reading to get a feel for their approach and perspective etc. As it happens, Dr Michael Newton is a very credible chap. Like most hypnotherapists I have come across, they tend to all start-off with a relatively traditional mindset and then something happens that causes a revolution in their thi Anybody who is spiritually minded and has an interest with the afterlife should definitely begin their quest by reading this book. I always find, it is worthwhile to explore any author's background before reading to get a feel for their approach and perspective etc. As it happens, Dr Michael Newton is a very credible chap. Like most hypnotherapists I have come across, they tend to all start-off with a relatively traditional mindset and then something happens that causes a revolution in their thinking. This book is a fast paced book that you won't be able to put down until it's finished. Dr Newton includes transcriptions from 29 case studies that are all unique in their own way; however, there are striking similarities in all these cases that will make even the skeptic think twice. آقای ناشر در ابتدای کتاب به کل تناسخ و با استناد به دین و اهل کتاب و نقل قول هایی از میرداماد و شبستری رد و باطل کردند! به شخصه مطالب خیلی جدید و ناشنیده ایی از این کتاب یاد گرفتم و خیلی از گفته های ارواح با عوالم دینی یکی بود؛ من جمله کتابی که در اون تمام طول دوره زندگی شخص متوفی ثبت شده بود که روح مورد نظر می تونست زندگی اش و مثل یک فیلم سه بعدی از طریق کتاب ببینه! اين كتاب كمكم كرد جواب تعداد زيادي از سوالاتي كه خيلي متزلزلم كرده بود رو پيدا كنم . مايكل نيوتن روانشناس و محقق آمريكايي كه از طريق خواب درماني يا هيپنوتراپي بيمارانشو معالجه ميكنه و تو حالت هيپنوتيزم گفتار بيمارانشو ثبت كرده و از اين طريق تونسته به هدف از زندگي،جهان هاي ديگه كه وجود داره و گذشته ي روح ها و جاهايي كه بودن و معني و مفهوم تناسخ و كارما برسه و در عين حال خواننده خيلي با بيمارايي كه ميان و احساساتي كه دارن ارتباط برقرار ميكنه . يكي از كمكايي كه اين كتاب كرد اين بود كه باعث شد خيلي آد اين كتاب كمكم كرد جواب تعداد زيادي از سوالاتي كه خيلي متزلزلم كرده بود رو پيدا كنم . "Mi smo božanska, ali nesavršena bića koja postoje u dva svijeta, materijalnom i duhovnom. Naša je sudbina prelaženje iz jednog svijeta u drugi kroz vrijeme i prostor, učeći kako ovladati sobom i razvijajući spoznaju. Moramo vjerovati tom procesu i biti strpljivi i odlučni. U većini fizičkih domaćina ne možemo u potpunosti spoznati svoju bit, ali Jastvo se nikada ne gubi, zato što uvijek ostajemo povezani s oba svijeta." "Najznačajnija korist od spoznaje da imamo dom vječne ljubavi, koji nas čeka "Mi smo božanska, ali nesavršena bića koja postoje u dva svijeta, materijalnom i duhovnom. Naša je sudbina prelaženje iz jednog svijeta u drugi kroz vrijeme i prostor, učeći kako ovladati sobom i razvijajući spoznaju. Moramo vjerovati tom procesu i biti strpljivi i odlučni. U većini fizičkih domaćina ne možemo u potpunosti spoznati svoju bit, ali Jastvo se nikada ne gubi, zato što uvijek ostajemo povezani s oba svijeta." This remarkable book, and its companion book Destiny of Souls, have changed my life. When I first read them, I instantly wanted to try the ground-breaking form of spiritual searching they describe, and in 2005 I had my first Life Between Lives Hypnotherapy session. The experience was akin to what people call a Near Death Experience. I indeed visited with my Soul Group, met my spirit guide, and appeared in front of my Council of Elders to hear their incredible wisdom for the first time. Since tha This remarkable book, and its companion book Destiny of Souls, have changed my life. When I first read them, I instantly wanted to try the ground-breaking form of spiritual searching they describe, and in 2005 I had my first Life Between Lives Hypnotherapy session. The experience was akin to what people call a Near Death Experience. I indeed visited with my Soul Group, met my spirit guide, and appeared in front of my Council of Elders to hear their incredible wisdom for the first time. Since that day, I have experienced LBL hypnotherapy several times, each with powerful insights from the other side– above all, the encouragement to "be" love in this life. I am no guru–just someone who likes talking (and tweeting) about spirituality. I realise it may sound outrageous that we can get hypnotised and see Heaven. But thanks to the techniques first revealed in this book, anyone who has questions about the afterlife can simply try an LBL for herself and experience the world of joy and love that I saw under LBL trance. Newton Institute-trained hypnotherapists are increasingly easy to find, and I am positive that LBL hypnotherapy will someday be recognized as the "hotline to Heaven" that it is. 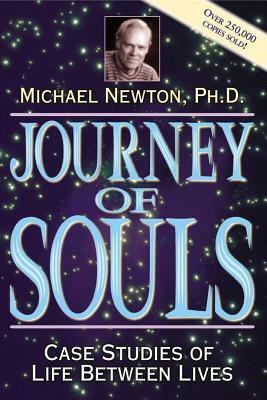 Our past lives, and the love lessons they impart, are alive in our subconscious–in this book, Dr. Newton reveals to us the time BETWEEN our lives, when the "veil of forgetfulness" of earthly incarnations is lifted. Someday, Michael Newton will be regarded as the pioneer he really was. Dr. Newton reports conversations with patient under hypnosis who have been regressed past the birth of this lifetime. It is very thrilling to conceive of a community, a continuing learning, a teaching about what this lifetime is about. It is thrilling to think that there is evidence at last that life doesn't end, or at least doesn't end with death as it appears to us. Just think of it! "But ..." the cynic in my brain says, "Really? Can we believe this? Who is this guy? What is the evidence, where Dr. Newton reports conversations with patient under hypnosis who have been regressed past the birth of this lifetime. It is very thrilling to conceive of a community, a continuing learning, a teaching about what this lifetime is about. It is thrilling to think that there is evidence at last that life doesn't end, or at least doesn't end with death as it appears to us. Just think of it! "But ..." the cynic in my brain says, "Really? Can we believe this? Who is this guy? What is the evidence, where is the science ... Are these reported cases evidence of life after death?" My research on the internet turned up other cynics and those who plainly call this book, and others Dr. Newton has written, exaggerations at best, downright fabrications at worst. And I found many who rejoice, rejoice to read these studies. My ex husband (of 12 years) passed away this month, after a few short months of battling cancer. He was 36, and although we divorced a couple years ago, we were still very much good friends. This event made me reflect on what I really believe when it comes to death, and where he might be now. This book is incredibly insightful and gives you a lot to think about. It gave me a great sense of peace and removed any lingering fear I had about the process of death. While I don't think anyone knows FOR My ex husband (of 12 years) passed away this month, after a few short months of battling cancer. He was 36, and although we divorced a couple years ago, we were still very much good friends. This event made me reflect on what I really believe when it comes to death, and where he might be now. Found this in a used book store - was curious about the subject. Kept it on my nightstand to read but other books kept taking it's place. For me, it was best to read in short bursts. Interesting read though. I've always wondered if we are in fact reincarnated in order to achieve soul goals (for lack of better wording), then why the heck can't we remember what we learned in previous lives? This book answers that and more. Michael Newton, Ph.D., born in 1931, holds a doctorate in Counseling Psychology, is a certified Master Hypnotherapist, and is a member of the American Counseling Association. He has also been on the faculty of higher educational institutions as a teacher while active in private practice in Los Angeles. Over many years, Dr. Newton developed his own intensive age regression techniques in order to ef Michael Newton, Ph.D., born in 1931, holds a doctorate in Counseling Psychology, is a certified Master Hypnotherapist, and is a member of the American Counseling Association. He has also been on the faculty of higher educational institutions as a teacher while active in private practice in Los Angeles. Over many years, Dr. Newton developed his own intensive age regression techniques in order to effectively take hypnosis subjects beyond their past life memories to a more meaningful soul experience between lives. He is considered to be a pioneer in uncovering the mysteries about life after death through the use of spiritual hypnotic regression. He now trains other advanced hypnotherapists in his techniques.